nyskidooerinnewhampshire had the most liked content! Had the "Indians" / original settlers seen this polar bear image back in the day I am curious as to what they would named the mountain. Very cool in so many ways....Thanks for sharing. "Pictures won’t do justice. ".......So true. Always disappointed when comparing the captured electronic image vs real life / real time image. Thanks for the blogs. Much appreciated. Enjoy. WOW ! Great news. Great honor. Congratulations Bill. I for one can in part thank Bill on behalf of myself & family members for the initial introduction to the Saguenay region / Hotel Delta. After I wrote to Bill cold turkey he promptly replied and with great confidence he encouraged me to make the journey to paradise. The rest is history. Thank you Bill. Paddy & Ginny O & family. Read in a 3rd party post on FB the ferry had a hard docking and put a hole in the hull causing the ferry to be put out of commission. We don't always have the luxury of moving on to the next fuel station when we are on the sled but I have made it a standing practice since I learned to drive not to get fuel when the tanker is present. Tanker drivers that I have spoken with , when I inquire specifically what they are delivering have told me with todays filters it is not a concern, other tanker drivers have told me they too practice what I preach...move on..let it settle. Good morning Joe. Eddy O & Liam did not travel with us on this journey. Eddy O did come with us a few weeks back to Caribou. Liam is a freshman attending Binghamton University & during school break he chose to stay behind & visit with the girlfriend despite speaking all year of the anticipated annual trip. Needless to say Liam lost a few favorable points with me....First year of college and he is ruined. Ha ha On Monday we left RDL, Tuesday Matane, Wednesday Maria outside of New Richmond, Thursday Rimouski & back to RDL in 2.5 hours arriving @ 1130. A quick change, load trailer, and stock up on Cadbury chocolate @ the neighboring fuel stop & on the black trail @ 1pm arriving in Pittsburg at 7pm with 2' + - of new snow to shovel to get in the door. Referring to supporting QR where do we stand with the QR referral cards written in French where the card states in sum & substance we are eating / sleeping here because the business was referred too on QR? The entry level receptionists / hostesses we mentioned QR too were unaware of the QR website. The idea of providing the card written in French with contact information for advertising on QR is optimal. For purposes of supporting this site I regret I didn't have any cards to offer. Attached are a handful of photos depicting the fantastic trail conditions & weather we encountered. 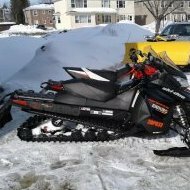 Maiden voyage...Running in standard mode, saddle bagging & pushing snow we did 18 on smooth trails & 15mpg on the day we were pushing snow @ 45 x 60mph....tank holds 9.5 gallons. Average speed at the end of the day was 30 x 35 mph with food, fuel & photo stops. Sleds ran at an average of 170F with one sled always running +2 in comparison to the other. Would at times fluctuate between 165 & 180F.